More people work alone than you think. Berg Insight reports there are a whopping 53 million lone workers in Canada, the United States and Europe combined. That’s about 15 percent of the overall workforce. Regarding global numbers, International Data Corporation (IDC) estimates that approximately 1.3 billion people are mobile workers, many of which work alone continuously or at various times throughout their workday. Some of your team members may work in remote areas of the world, be isolated outdoors or face hazardous conditions. Others may be driving alone or to remote locations. Lone workers face many risks every day—in fact, the International Labor Organization (ILO) estimates 2.3 million work-related fatalities occur each year due to accidents, injuries and diseases. While many lone worker roles are obvious, others may not be as clear. Here we take a look at lone working situations, including those in indoor, outdoor, remote locations and driving conditions. Your employees should never feel they are working alone. Whether your teams are working inside on large skyscraper construction sites, underground in water treatment plants or even in warehouses, laboratories or medical centers, being accountable for the safety of all personnel, in real-time, can be a challenge. Even though other crew members may be nearby, there are often times when your employees truly are alone, out of sight and out of earshot. For example, in a large construction site, your employees may be required to work on a task in a room segregated from where the majority of the work is being completed, or may be required to scale up a level to complete an installation or to reinforce part of the structure. If colleagues can’t see or hear one of your team members and they are injured on the job, emergency response may be required and management needs to be advised. 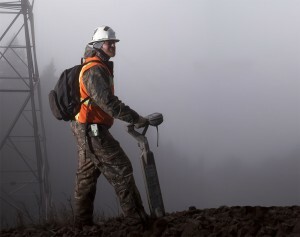 From logging and mine sites to power plants and oilfields, many employees work outdoors and are required to perform their duties regardless of environmental conditions. In these locations, there’s often only a single worker at a particular site for extended periods of time. This poses many risks for the employee as he or she may suffer fatigue, electrocution or be struck-by moving objects and become unable to ask for help. With unpredictable weather, emergency response may be delayed, so the sooner you are aware of an incident, the better the outcome can be for your employee. Some of your team members venture out for long hauls or drive to and from the worksite. Road conditions can be unreliable, and when combined with fatigue after a long day of work or extended shifts, driving can be dangerous. You’re responsible for their safety, even if it’s a health incident that’s looming. Should a vehicular collision occur where a truck or long-haul flips and renders the driver unconscious, your employee may require emergency assistance, where time is of the essence. Some of your employees may work in the most isolated areas you can dream of, where satellite coverage is the only way to connect. Your land survey crews may be in the mountains, biologists in boats conducting research on the rivers, up North, or operators in the oilfield going about their rounds. Falling into the water or off of a powerline can render your employee injured or unconscious. Working alone is a risk—even in locations where help is nearby, but the fastest emergency response possible to a downed engineer or crew member can make the difference between a life saved and a life lost in the most remote reaches of our planet. Regardless as to whether your lone workers operate indoors, outdoors, while driving or in remote locations, the above situations may be lone worker scenarios you have not considered before. But you are now, right? Lone workers face many dangers on the job. From slips, trips or falls and heavy objects to vehicle collisions, explosions, fires and chemical exposures—ensuring you have the right protocols in place for your lone workers is key. Stay tuned as we explore Lone Workers Indoors, the second post of six in this series, coming soon. Subscribe using the form on the right to learn more about Blackline Safety.